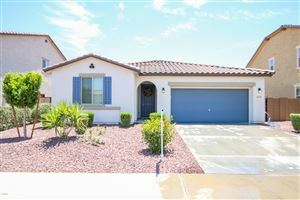 Canyon Trails is a moderately priced subdivision south of I-10 in Goodyear, Arizona that features a variety of family homes, mostly two story in differing price ranges. Nicely planned it has public areas and open spaces for walking and recreation. Its schools are newer construction as it the community itself, having sprung up in the housing runup prior to the 2010 decline. Distinctive neighborhoods with names like Stallion Pass provide variety to the neighborhoods which are part of this large planned unit development. Shopping has grown up around the area providing access to most items needed for daily living plus entertainment venues which are not far away from home. The newer and larger homes are toward the south end of this community where the lots tend to be larger also. A number of builders have been active in the community providing quite a few choices for homebuyers. Several of these are still active in the community offering the chance to purchase either a new "Spec" home for quick move in or building from the ground up to incorporate all the features you would like to see.